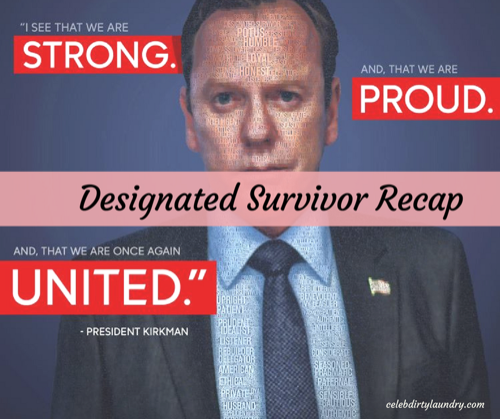 Tonight’s episode of Designated Survivor kicks off with Hannah rushing to President Kirkman’s speech – she has just discovered that there will be an assassination attempt. When she arrives, Kirkman is taking the podium, and there are thousands of people in the crowd. In a window of a nearby building, Hanna spots a sniper gun aimed at the President. In a split second, Hanna whips out her gun and fires at the sniper. Meanwhile, security officers rush Hannah when they see her gun, completely unaware that she is trying to save the President, not kill him. Chaos ensues, and the croud begins panicking. President Kirkman tackles Alexis to protect her when shots ring out. After the dust has settles, Kirkman notices blood on Alex and thinks that she has been shot – suddenly he makes the realization that it’s his blood, and Alex is just fine, he’s the one that was shot. Medics rush the President to a nearby hospital, which has already been locked down by secret service agents. The doctors say that the bullet was a clean shot and exited through his back. They just have to run X-Ray to make sure that there was no internal damage. Meanwhile, Hanna Wells is in a world of trouble. John Forstell sits down with her in an interrogation room – he tells her that they have her for killing a man, and leaving the scene of an accident. Not to mention, they found a key card in her pocket that opens the building where the sniper was located, and if she doesn’t have anything to say, she’ll be going down for conspiracy to kill the President. Hanna refuses to chat with Forstell and tells him she already gave her statement. Emily and Seth are finally allowed in to see the President, he tells them to get word out to the press and begin dealing with the media. Everyone is in an uproar because the shooter is still at large. Peter gets a phone call and learns that Kirkman is alive. After he hangs up, he warns his wife that the plan was a total fail, and if the cops find the shooter they were working with – then they are going to be totally screwed. His conniving wife reassures him they have nothing to worry about. After meeting with President Kirkman, Emily takes Alex aside and tells her that they have a situation. She didn’t get a chance to tell the President before the shooting, but a call came from the White house to kill a report, and it was from Aaron’s office. Emily is freaking out – Alex tells her that right now her job is to keep Aaron as far away from her husband as she can. President Kirkman has to go under anesthesia and in to surgery, they have no choice but to invoke the 25th Amendment and put Vice President Peter MacLeish in charge of the country until Kirkman is awake and functioning again. Meanwhile, Mike heads to the interrogation room to try and talk to Hanna Wells. He tells her he knows that she had info on MacLeish for the President and he needs to know what it is. Vice President Peter has his hands full as soon as he takes over. Of course his wife is right there whispering in his ear. The stock markets are crashing, Kirkman’s people want Peter to issue an executive order and shut the market down for a day. But, he absolutely refuses. He tells them to make a press release and tell people that America’s business is just fine, and not to panic. Mike returns to the interrogation room, he says he has an update and reveals that the President is in surgery and invoked the 25th Amendment. Hanna freaks out when she realizes that Peter MacLeish is the current President of the United States. Kimble storms in to the Oval Office and tells Peter that he’s making a huge mistake not shutting down the stock markets – it’s going to be a total disaster. Kimble sees right through MacLeish, and she warns him that she will be watching his every move and has no problem taking her suspicions to the Core. Hanna wants to answer Mike’s questions, but she can’t because they are being watched via the camera in the interrogation room. As Mike is leaving, she jumps on his back and pretends to attack him, and whispers something in his ear. VP MacLeish gets word that they have found Kirkman’s shooter, and he has barricaded himself in a building. He advises the troops going in to “Shoot To Kill.” Obviously he wants the shooter killed so that he can’t be traced back to him. Aaron argues with MacLeish and tells him that they need the shooter alive so they can get answers. MacLeish ignores everyone – and watches via live feeds as the army officers shoot the sniper that nearly killed the President rather than taking him alive. Alex and Seth are staying close to Kirkman, and sipping coffee together in the waiting room while they wait for the President to come out of surgery. Alex breaks down in tears and cries to Seth, she blames herself for Kirkman getting shot, because she’s the one that convinced him to take the job. Mike tracks down Chuck, thanks to the tip from Hanna while she was pretending to choke him. He shows him a picture of Catalan. Chuck explains that Catalan and MacLeish were in the same army together, the Vice President knows the shooter. The White House is a total mad house. While Emily is trying to straighten everything out, Aaron corners her and demands to know why she was looking in to his phone archives. Emily says she’s “not at liberty to say” and he needs to speak to the President when he comes back. Aaron is freaking out, he knows he was being investigated for something. At the hospital, Kirkman’s surgery is getting a little hairy. The bullet knicked an artery and the President was bleeding out on the surgery table. Luckily, they were able to patch him up and get him out of the woods. Catalan is dead, but Peter MacLeish isn’t so sure that the shooting won’t be tied to him. His wife gives him a ep-talk and reassures him that if there are any more problems, they will “remove them” just like they did Catalan. Tom Kirkman is out of surgery, his wife Alex rushes to his side so she can be there when he wakes up. The next day, the stock market is crashing, just like everyone told Peter it would if he didn’t shut down the stock market. Alex gives her husband an update and tells him that the doctors removed all the bullet fragments and there’s no permanent damage. Alex admits to Kirkman that MacLeish opened the stock market, and there are some complications. President Kirkman freaks out, he needs to restore confidence and let the people know that he is okay. While Seth is holding a press conference in front of the hospital, Kirkman opens his door and waves to the crowd outside. Immediately afterwards, the stocks begin to rebound, and everyone is thrilled. Except for Peter MacLeish. Mike shows up at Tom’s room and everyone clears out. Mike has pulled some strings and brought Hanna to Kirkman’s bedside. Once Hanna and Tom are alone, he demands to know everything she knows about Peter MacLeish.